Our Mission is to make a difference while making a living, to be good stewards of our land and create collaborative community developments that are beneficial to all concerned. We specialize in assembling parcels and redeveloping complicated infill projects in Ozaukee County. Cindy Shaffer is the Founder and President of Shaffer Development LLC. Since 2001, Shaffer Development has purchased and been awarded several properties in Ozaukee County. With Shaffer Development’s current projects, we will have completed close to 100 Million in successful development projects. 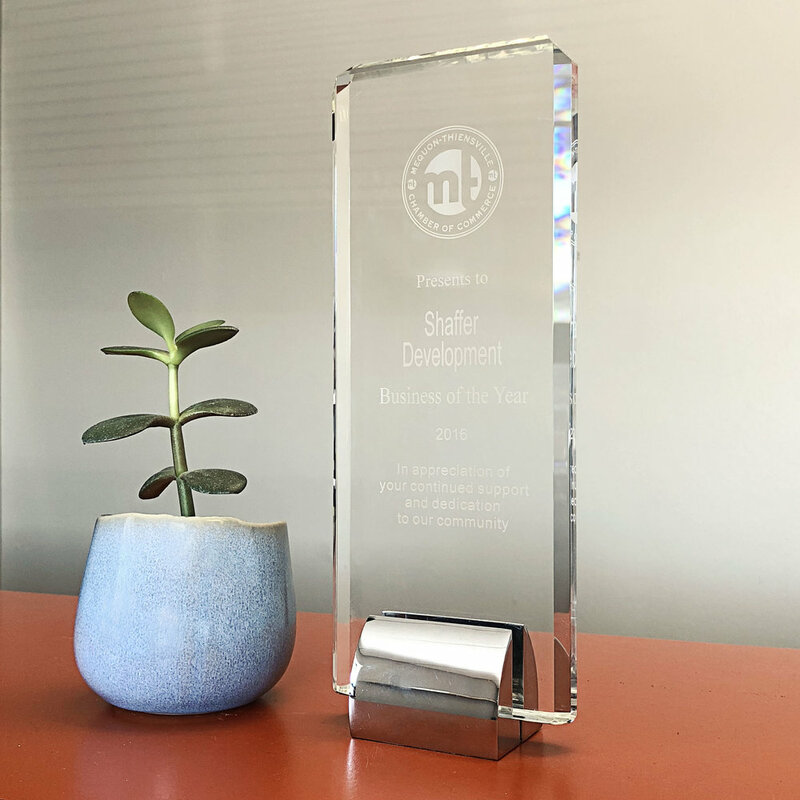 Shaffer Development was awarded the 2016 Business of The Year by the Mequon-Thiensville Chamber of Commerce and Cindy Shaffer has recently been recognized as a Women of Influence by the Milwaukee Business Journal. A graduate of the University of Wisconsin Madison with a degree in marketing and communications, Shaffer's experience includes working for S.C. Johnson and Sons, Marriott Corporation, The Mandel Group and Fiduciary Real Estate Development. She broke into real estate by converting duplexes into condos. Since then, Shaffer has co-developed the Mequon Town Center, developed the Grafton 1505 Apartments and is currently working on the 13.9-acre Spur 16 project. "She's just a go-getter, and willing to put in the time to get done what she needs to get done" says Glenn Stadler, Executive Vice President-Chief Lending Officer at Westbury Bank. Shaffer is the current president of the Mequon-Thiensville Rotary and is both a volunteer and sponsor of many community organizations. Cindy was recently announced as one of the 2018 Women of Influence. When asked about her business Shaffer says, "I am not in the property business, I am in the people business." Jenni Vetter joined Shaffer Development in April of 2017. She is an experienced business leader with a successful history of working in manufacturing and product development. Her skills include trend analysis, wholesale sales, retail development, team management and leadership. She is a strong professional with a BA focused in Merchandising and Design from International Academy of Merchandising and Design Chicago. Carly received both her Bachelors and Masters degrees at the University of Wisconsin-Milwaukee. She is a CPA with over five years of public accounting experience. She most recently worked as an accountant and project manager for a local interior design firm. Mary Kanavas joined Shaffer Development in January of 2018. She is a graduate of University of Wisconsin-Madison, and has gained her well-earned reputation in the area of relationship management through working across a variety of industries. These include travel, banking, trust services and, most recently, working to build key donor relationships on behalf of the United Way of Greater Milwaukee and Waukesha County. Mary will play a key role in working with our investment partners to ensure ongoing, cohesive communication as we look to the future and exciting opportunities ahead. Lilly Stenbroten is a photographer, videographer and web designer. She has worked with an award-winning Milwaukee photography company for seven years before joining Shaffer Development in January. With a background in visual arts, she has a great eye for composition and consistency.